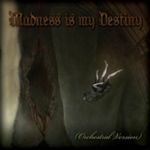 * "Madness is my Destiny (Epilogue)" of from the 2013 album "Dreams in the Witch House A Lovecraftian Rock Opera" which original runs 5:35, received a grand make-over with a cinematic, orchestral version . released February, 2016 as digital download only. Strings, oboe and English horn sessions conducted by Jeremy Rubolino. Stagg Street Studio sessions enigineered by Brian Virtue, assisted by Josh Franks. Mixed by Brian Virtue. Mastered by SoundLab. Track 16 from 2013’s A Lovecraftian Rock Opera, “DREAMS IN THE WITCH HOUSE” received a grand make-over with this cinematic, orchestral version showcasing the dynamic talents of Depeche Mode drummer Christian Eigner, Mother’s Finest bassist Wyzard and former KISS guitarist Bruce Kulick. With rich orchestrations composed and conducted by Jeremy Rubolino and a propulsive arrangement by Anders Ringman and Jeremy Rubolino, you’ll find yourself transported deep into black seas of musical infinity. The third new track of the 2CD expanded edition of "A Lovecraftian Rock Opera" can be purchased as a Flac/MP3 download at www.cdbaby.com. 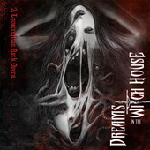 In 2013 Dreams in The Witch House have released an album with the same title "A Lovecraftian Rock Opera", also featuring Bruce Kulick. click cover to buy !